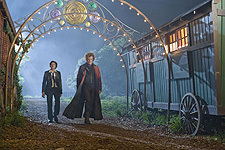 ShockTillYouDrop.com reports that Universal Pictures has changed the title for “Cirque du Freak” to The Vampire’s Assistant (it’s the title of Darren Shan’s second book in the “Vampire Blood” trilogy) and moved up the release from January 15, 2010 to October 23, 2009. Other new wide releases scheduled for Oct. 23rd are Amelia, Astro Boy and Saw VI. “The Vampire’s Assistant” tells the frightening tale of a boy who unknowingly breaks a 200-year-old truce between two warring factions of vampires. Pulled into a fantastic life of misunderstood sideshow freaks and grotesque creatures of the night, one teen will vanish from the safety of a boring existence and fulfill his destiny in a place drawn from nightmares. 14-year-old Darren (Chris Kelly) was like most kids in his suburban neighborhood. He hung out with his best friend, got decent grades and usually stayed out of trouble. But when he and his buddy stumble upon a traveling freak show, things begin to change inside Darren. That’s the exact moment when a vampire named Larten Crepsley (John C. Reilly) turns him into something, well, bloodthirsty. Newly undead, he joins the Cirque Du Freak, a touring sideshow filled with monstrous creatures from a snakeboy and a wolfman to a bearded lady (Salma Hayek) and a gigantic barker (Ken Watanabe). As Darren flexes his newfound powers in this dark world, he becomes a treasured pawn between the vampires and their deadlier counterparts. And while trying to survive, one boy will struggle to keep their brewing war from devouring what’s left of his humanity.